Home MOTHERHOODBABY Omg I’m so stinking excited! Omg I’m so stinking excited! Calm down! It’s nothing too special. It’s just yesterday we finally ordered a Yamaha keyboard! I play (or am learning to play) drums and hubby has always been really good on piano/keyboard, but haven’t had one in ages. I really think he has talent, but he’s always wanted a $1000 keyboard which seemed like a waste of money considering it’s solely for fun. I tried to convince him to settle down for a cheapy keyboard ( you can get a great one under $200), but he’s been too proud to do so. Personally, I’ve always wanted to buy a keyboard and learn how to play, but he would refuse to let me get a lighted keys one ( yeah I know I’m a kid at heart). So that’s where it always stopped. Now that I got myself an electronic drum set, and have quite a blast playing drums, we resumed our keyboard negotiations. 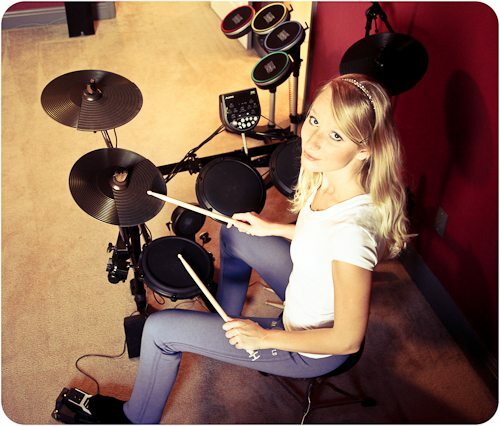 See, I like to play my drums to Rockband 3. I don’t actually hook it up to the game, but just have the drum part muted and the notes displayed on screen, so that way I am playing along to my favorite songs, and it is actually me playing the sounds, not the game. So Rockband has a part for a keyboard on almost every song and we always thought it’d be fun for hubby to play along with me. It’s much easier since the notes are displayed on the screen and both of us do the singing part ( yeah we’re dorks). So now that I am pregnant, he finally saw the point in buying a cheap LIGHTED KEYS (score!) keyboard so that he can use it for the time being and then it will become a learning tool for both me and the baby. Can you imagine a little 16 months old following along the lighted keys? How cool is that? So here’s the keyboard. It’s under $200 bucks, but it’s definitely better than any other lighted keys keyboards out there. And the biggest feature of it is that when you’re in the lighted keys/learning mode, it actually waits for you to hit the note, rather than continues playing the song, if though you missed the note, like Casio does. I just wanted to share! So what instruments do you guys play, if any? Where’s my mommy when I need her? I play piano myself! Ive played since I was 11. My momma made me finish my classes when I went through the typical rebellious stage and Im so glad she did! Its kinda a way to relax when im stressing out or something. Music is definitely a form a therapy in a way I think, LOL!. Glad you’re feeling better! Congrats again on the little one! Yeah!! That’s gonna be so sweet. I love picturing your 16 mo old playing along….adorable!! Well, then it seems that a keyboard is your solution. They’re super cheap, not too loud and you can always use headphones. I love the idea of playing a song for my baby once it’s able to hear in the womb, and then having him/her recognize the song once I give birth. I’ve had a few girls do that and it works like magic. I play the trumpet, and am self taught on the keyboards, although not nearly as good as I’d like to be. Have fun! mmmm! dumplings sounds good ! now I don’t play. I have a keyboard and it’s “serving a purpose” of a toy for our daughter. I’m glad that she really enjoys it. Hi!! Just found your blog and I am really enjoying it as I am just a couple weeks behind you in my first pregnancy! I was wondering if you would consider doing a post about your hair and makeup routine/products you are currently using. I am trying to use as natural products as possible, but am having a hard time finding ones that are safe and also actually work! I know what you mean about hair/skin products. I had a super hard time finding things that were 100% safe for pregnancy. I did write a post about the skin products I found that are actually screened against teratogens. You can read about it here. But I had a problem finding a moisturizer and other products. Unless you’re willing to screen all the ingredients of a products against millions of teratogens yourself ( which I did have to do), it’s difficult to know what’s safe. I’ll be sure to write a post about what I’m using right now.